Visit the most populair destination for visitors all over the world: the famous Dutch flowergarden Keukenhof! This Hop On Hop Off tour is the easiest way to visit this wonderful spring garden! Flower Power will be the theme for 2019. With bright colours, hippies, peace & music, Flower Power has that 1970s vibe. Therefore, it perfectly reflects the 70th Keukenhof! Take the trip to Keukenhof! From Amsterdam Central Station, you can take the free ferry with direction “Buiksloterweg”. This is only a 3 minute boat trip. From here, it is just a 1 minute walk to THIS IS HOLLAND. The check-in is at the giftshop. You can also explore the countryside with our bus! Though the Keukenhof is a world famous park, almost everyone, except for the Dutch of course, has trouble pronouncing the name “Keukenhof.” That raises the question; why is it called ‘Keukenhof’ , instead of an easy name, such as Tulip Park? Well, this is an interesting story, that goes back to the 15th century. Countess ‘Jacoba van Beieren’ went to these fields to gather food for the kitchen of their castle. ‘Keukenhof’ means ‘Kitchen Garden’ in Dutch, so there you go. The Keukenhof is the No.1 visited tourist attraction in The Netherlands. The Keukenhof of today is the initiative of a group of bulb farmers; they were interested in a permanent exhibition. In 1950, the park opened its door and during the last 67 years Keukenhof has grown into a world famous attraction. 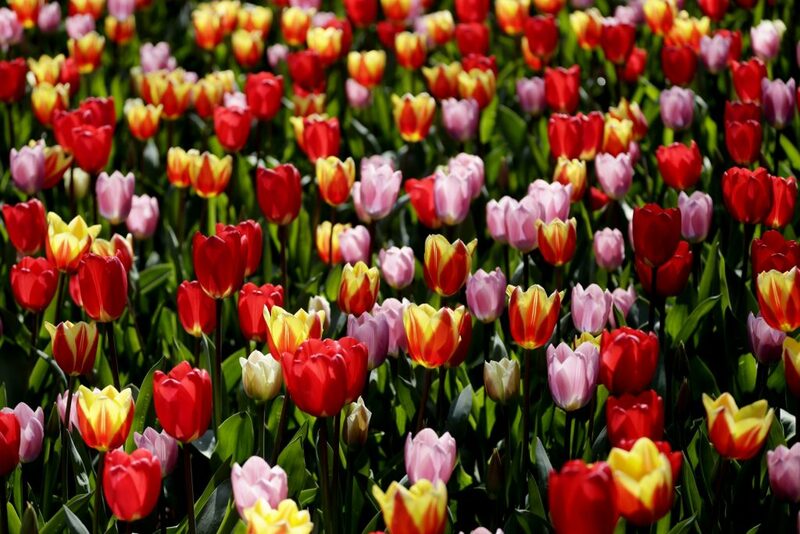 Over 7 million bulbs are planted by 100 flower bulb companies. During the whole year, a team of 40 gardeners is busy making Keukenhof the beautiful park that it is today. You can also visit the Countryside of Amsterdam with our busline! Visit Zaanse Schans, Volendam and much more!